It’s the first time two Seattle Public Schools have played for a spot in a state title game. Three of the four semifinal spots are from Seattle as O’Dea faces Bellevue. Perhaps we shouldn’t be surprised. We, meaning Seattle-area residents who follow the high-school football scene. Scroll through Garfield and Rainier Beach’s rosters and the talent is abundant. Naturally, that should translate into the programs contending for a state championship. At Edgar Brown Stadium, Pasco 1 p.m.
At Sparks Stadium, Puyallup, 5 p.m.
At Pop Keeney Stadum, Bothell, 5 p.m.
Lions Field, Moses Lake, 1 p.m.
Civic Stadium, Bellingham, 4 p.m.
Central High School, 7 p.m.
Gonzaga Prep, Spokane, 3 p.m.
At Edgar Brown Stadium, Pasco, 4 p.m.
Civic Stadium, Bellingham, 1 p.m. This could be the biggest game between two city teams since the days of Bruce Harrell and Anthony Allen. 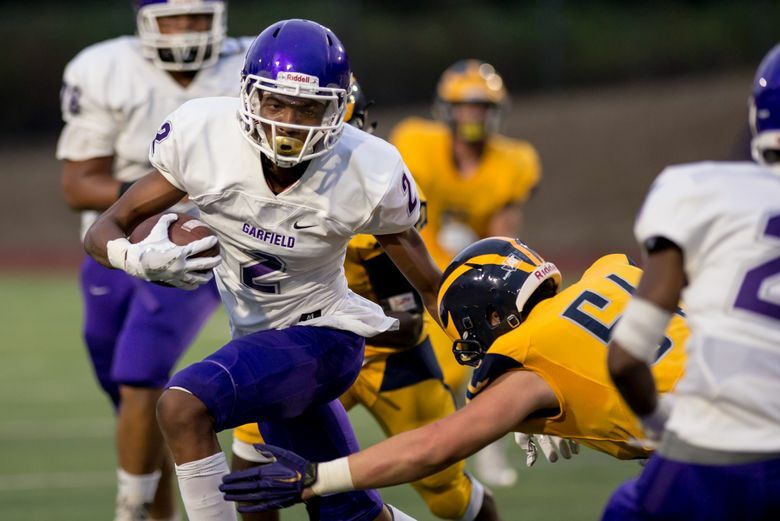 The future University of Washington stars were part of the 1975 Garfield team that lost to Metro League rival Bishop Blanchet in a first-round game. The game was played before a sold-out crowd of almost 13,000 at Memorial Stadium. Garfield lost in four overtimes, 42-35. Many expect a similar feel at Pop Keeney Stadium for Saturday’s 5 p.m. game. O’Dea (10-1) plays its state semifinal matchup against Bellevue (11-1) at noon as part of twinbill. The Beach-Garfield game will feature 15 legitimate Division I prospects, according to Brandon Huffman, a longtime scout for 247Sports.com. Garfield senior receiver Tre’Shaun Harrison (Oregon) and Rainier Beach junior lineman Nathaniel Kalepo (Washington) are already committed to Pac-12 schools. Garfield coach Joey Thomas and Rainier Beach coach Corey Sampson designed their schedules to put their players in position to contend for a state title. Sampson pinpointed travel and hostile road environments and started his season by taking his team to Oregon to play Madison. Beach won 34-6. And during its state-tournament run, the Vikings traveled 650 miles to collect wins at Mt. Spokane and Peninsula. Thomas went the ultracompetitive route. Four of the Bulldogs’ eight regular-season opponents played for a state title in the past two years. Garfield was outscored 142-55 in losing all four. In the playoffs, the Bulldogs upset top-ranked Eastside Catholic and Lincoln (which finished the season ranked fourth) by a combined six points. Beach defeated Garfield 27-12 at Memorial Stadium in October. A difference-maker was Vikings senior quarterback Max Nall, who started under center for the Bulldogs last season. He opened the game with a fumble, but was savvy enough with Garfield’s defensive scheme to help get the win.